I’m not being totally scattered. In this digital age there is a good reason for my confusion. Getting the Mercury Out is going to be released on Amazon.com in both eBook and paperback formats. The eBook will come first. It will be available next week for instant download. It’s going to be a Kindle edition, but luckily, you don’t need to own a Kindle device to read Kindle books. They can be read on PCs, Macs, iPads, iPhones, the list goes on. You can download the software that makes it all possible here. 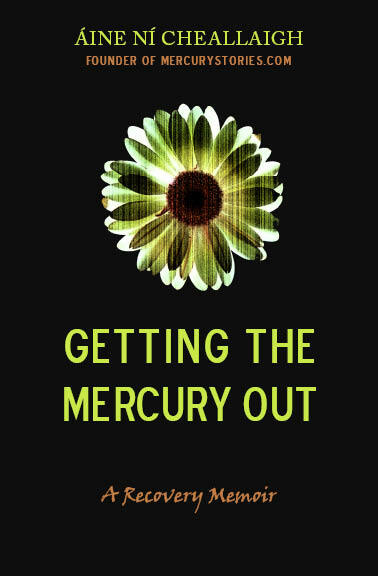 So for all you paper lovers, some time in May, Amazon will release a paperback edition of Getting the Mercury Out. When exactly? That’s not certain. I will let you know as soon as I hear. Watch this space. I’d like to take 100% of the credit for this awesome design, but I couldn’t have done it without the fabulous Susan Walsh. Earlier this week, she took a break from designing books for the rich and famous to walk me through the finer points of cover and interior design. Having a consultant like her on hand is an amazing experience. I’m learning so much! So the countdown begins to the first half of the book launch. I will post here as soon as the eBook appears for sale on Amazon…. ← ‘Getting the Mercury Out’ Sneak Preview! Awesome! So excited! Cover looks amazing! Really looks professional. And i love the “Founder of Mercurystories.com” Ha! cool. Wish i could write as quick as you! cant wait to read your book. we have suspected our daughter of having mercury poisening since birth. We have been laughed out of GP’s for years. She had a thermometer broken in her cot on the day of her birth and the mercury spilled and stained her sheets and she was exposed for hours. every person we speak to knocks us back, but none will give us any medical reason why it cant have affected her. She has had all sorts of problems since. Anyway, cant wait to read your memoir. It’s amazing how the powers that be have decided to put up a brick wall. They’ve decided that “ordinary” exposure cannot cause mercury poisoning, ever. With that kind of attitude, how can they ever gather data from all of the cases of chronic mercury poisoning that they do encounter? It’s mind-boggling how closed-minded they can be. Good luck with your daughter. I hope that reading the book helps a little by giving you a working picture of this “disease that doesn’t exist”. I didn’t know you were a writter. It sounds like You have had your share of the poisons that surround us in everyday life. This is the business of living in the “Industrial Age”. People have no idea of the chemical ocean that we live in and the health risk involved in our modern existence. This is the tip of the iceburg. The EPA only recognizes a small fraction of the known poisons we are exposed to in our everyday lives. I fear the worst is yet to be discovered…….and hope our children will survive the legacy we leave behind with the advent of our Toxic imprint on our “Terra Firma”. Sonny, I don’t know who is going to clean up this mess for the generations coming after us…it’s a chilling thought. I just hope that we can raise awareness so that we can slow down the rate at which we’re turning the world into a toxic stew.